We tackle the biggest logistics transportation problems, daily. You have enough to worry about. At Port City, we aim to simplify your company’s transportation management by handling the crucial tasks so our clients can focus on what they do best. Port City values exceptional service in every client interaction. We recognize that one solution does not fit all, so we evaluate your transportation needs, discover efficiencies, and deliver the best value for your supply chain spend. Port City Logistics ensures you get the transportation management that’s right for you. We accelerate the supply chain process by delivering the products and goods that drive commerce. Optimizing your needs is at the core of all that we do. Whether you are shipping full truckload, LTL, over-size/over-dimensional, or port drayage, down the street or across the country, we have a solution to fit your needs. From single shipment needs to repeat contractual freight, our team of dedicated logistics experts will work with you to ensure we are delivering on time and on budget. Call or email us today to find out how Port City logistics can become the one stop shop for all your supply chain needs. We can handle all of your warehousing needs. When you choose Port City Logistics for your transportation, you get peace of mind knowing every step of your distribution process – from port drayage, to warehousing, to nationwide brokerage – is taken care of. Most of us are familiar with the idea of shipping freight around the world on a container ship and across the country by train or truck, but it’s easy to forget one integral step in the process: drayage. In the world of international shipping, the term refers to the transport of freight containers over short distances, usually from the dock where cargo is unloaded to a warehouse some distance inland. The term has its origins in an era when horses were used to transport cargo from ships to warehouses. The type of cart used was called a dray, and the horses were referred to as dray horses. Even though this method has not been used in more than 100 years, the term is now used for the shipment of freight via truck over short distances, usually from a port to an inland warehouse or distribution center. Since the advent of the shipping container, drayage is usually a matter of unloading one of the truck-sized steel containers off the freighter at the port and attaching it to a chassis behind a tractor trailer. 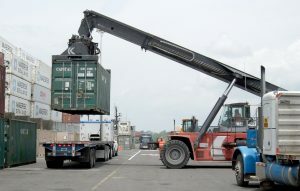 Once secured, the truck departs for a short-range destination, then returns with an empty container to be put back in circulation. Inter-carrier drayage: The transfer of freight units between modes, including ship-to-train or truck-to-ship, especially when there are different companies involved. Expedited drayage: Quick transport, usually be over-the-road trucking, of material that is perishable or otherwise time-sensitive. Intra-carrier drayage: For logistics companies that own several modes of the transportation network, this term refers to transfer between the company’s different modes. Door-to-door drayage: This occurs when a logistics company is able to deliver small amounts of freight directly to retailers rather than an intermediate stop at a distribution center or warehouse. Shuttle drayage: When freight units or empty containers are sidelined temporarily during backups on one end of the drayage process. Usually the freight is parked for a brief stay in lots or yards associated with the port. Pier drayage: This simply refers to the movement of freight from a rail or trucking hub directly to a pier for export or further freight forwarding. Port City Logistics is a single-source logistics team, handling port services, over-the-road trucking, warehousing, and of course, drayage. What is an Over-the-Road (OTR) Transportation Broker? This is where a 3PL provider can offer tremendous value. We secure qualified Full Truckload (FTL) transportation by finding and engaging qualified carriers for our clients. Port City Logistics has built a wide network of Over-the-Road (OTR) contractors that are fully vetted and dependable. Shippers don’t usually have the resources to build this kind of freight expertise and relationships with trucking companies. OTR freight forwarding is where a transportation broker is most helpful to companies with freight to get from A to B. It starts with scheduling. Along with the date, time and location, there’s an extensive set of data to gather, like the driver’s license, insurance coverage, equipment type and so on. During the loading process, the transportation broker stays in contact with the carrier (or their own driver if they have their own assets), until the Bill of Lading is signed and the trailer doors closed. Vital information is then confirmed, such as an inventory of the cargo, the destination, driver’s contact information and more. Once in transit, we stay in touch with drivers via GPS technologies and check-ins by phone. Re-routing due to weather or traffic can be done quickly by constant open communication. As soon as the truck arrives at its destination, the time is logged and unloading begins. After the trailer or container is empty, the Bill of Lading is signed and cargo ownership is officially transferred to the receiver. After that, the final detailed billing is submitted to the shipper along with any and all paperwork or electronic records that completes the obligation. In its most basic form, LTL shipping refers to carriers dispatching trucks with less than a full truck load of cargo. During former eras, this process sometimes proved prohibitively costly. Yet today, with the development of sophisticated logistics software programs, this form of shipping typically permits several shippers to combine their goods within a single container or truckload. Products reach their destinations rapidly and shippers pay for shared truck space, not the entire truck. If you’ve noticed business ads for “LTL shipping Savannah GA,” you’ve already encountered examples of LTL shipping. A carrier will accept cargo from multiple shippers, and a single truck transports these goods to their designated destinations. The spread of LTL shipping gained impetus in the U.S. during the 1980’s, following deregulation of motor carriers. The passage of key legislation by U.S. Congress encouraged many independently owned trucking firms to enter the marketplace. It stimulated new competition, a situation which dropped the average LTL price by nearly one fifth. The use of LTL shipping usually offers significant cost benefits for customers. This benefit has contributed to its popularity. The chief downside of LTL shipping involves the need to carefully coordinate logistical information, a factor which may result in slightly lengthier shipping times. For instance, and LTL truck may need to stop in multiple locations to pick up or drop off cargo. Some other advantages of LTL shipping relate to utilizing trucks more efficiently on the road. By helping reduce the shipment of partial loads, LTL freight haulers optimize the productivity of cargo hauling vehicles. Additionally, today sophisticated logistics programs facilitate precise cargo tracking. The popularity of LTL shipping has likely helped spur the use of enhanced logistical software programs, which in turn permits better tracking in transit. In this respect, LTL shipping also promotes greater transportation accountability. LTL Common Carrier Shippers: Some mailing services essentially utilize a form of LTL shipping to transport individually wrapped packages long distances to deliver to individual customers. From UPS to FedEx, these popular carriers rank as LTL common carriers. Consolidating LTL Carriers: These companies combine shipments by weight in variable quantities from 2 to 12 pallet loads. Truck Load Carrier LTL Shippers: Shipping involving a full truck which combines cargo from between two to six customers, a modified form of LTL shipping, has gained popularity also. Since these companies combine shipments from different sources, they technically do not perform full truck cargo hauling. Typically, several factors enter into the calculation of LTL rates. These may include the classification level of the freight, the distance travelled, the cost of fuel, and any special handling requirements. Logistics is all about finding the right mix of transportation modes that will fulfill our customers’ needs for moving goods from A to B. Finding the balance between a shipper’s needs like speed, volume, locations, budget and so on, and the best possible means of transport is what we do all the time! Geography– what assets are best and closest at hand? How far is your cargo going? The type and amount of cargo- Refrigerated? Heavy? Small amount? Huge amount? Oversize? Truck transportation is often the best solution for all or part of our customers’ freight requirements, especially for the “last mile” to their distribution centers, retail stores or warehouses, or the “first mile” from production facilities to shipping terminals. Tractor trailers are becoming ever more technologically sophisticated and efficient. We’ll soon see autonomous trucks powered by renewable resources on our highways that will reduce the impact on the environment. Need to move your shipments across town or across the country? Port City Logistics is your single source for all your freight forwarding requirements. Call us at 912-298-7150 or get our attention on our contact page.